When the Environmental Protection Agency studied indoor air quality, they found that professional hot water deep dirt extraction cleaning removed up to 1500% more indoor pollutants from carpets that had been otherwise vacuumed nearly every day. Environmental Protection Agency (EPA) studies* conclusively prove that ordinary home cleaning and vacuuming cannot compare with professional cleaning technicians who are expertly trained. EPA studies indicate that you need to have carpets cleaned professionally at least twice per year and oriental or handmade rugs professionally cleaned once per year, to eliminate the build-up of these pollutants. What the EPA discovered about in-home air pollution. These are unhealthy pollutants that the EPA has determined are found in carpets and rugs, resulting in a number of health problems from common colds to more severe conditions in the lungs and bloodstream. What’s polluting my indoor air quality? Respirable particles (dust & dirt that can get in your lungs) are the most common culprit of indoor air quality. Add to that the formaldehyde and glues used to assemble office furniture and fixtures. Add to that carbon monoxide, radon, asbestos, sulfur dioxide, ozone, lead and the most dangerous, bacterial pollutants, such as cladosporium, penicillium, and aspergillus. Bacteria feed on the dead skin cells that each of us shed every day. 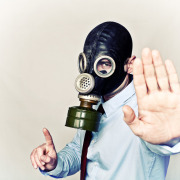 OSHA reports that 1.34 million office buildings have some problems with poor air quality. HR Magazine reported that U.S. businesses would save as much as $58 billion annually by preventing sick building-related illness. Even more, they estimated that the U.S. business could increase your performance by $200 billion annually, if indoor air quality was improved. One of the six major causes of stress is you indoor environment. Stress is one of the biggest causes of lost productivity, lost work time and employee turnover. Xerox estimates that it would cost $13,000 to replace on office worker and up to $1.3 million to replace a top executive. While other studies show that the average cost to replace a salesperson is $60,000. Pollutants in the environment trigger stress among workers, with 30% of adults reporting an impact at work. Stress can cause a suppressed immune system, inviting colds, flu’s, and other disorders or illness. The Swedish government did a study, similar to our EPA studies and found that the carpet service as a catchall for toxins and indoor pollutants. When they removed the carpet they found that office illness dramatically increased. The conclusion of the study, and our own EPA studies, found that the carpet acts like a giant health filter, capturing dust, dirt, bacteria and other pollutants. But they also found that your carpet becomes saturated and needs professional cleaning. Is YOUR office carpet saturated with pollutants? The EPA has studied the impact of indoor pollution and the importance of professional hot water deep dirt extraction cleaning. Here is what they found: You can have your carpets vacuumed every single day and professional hot water deep dirt extraction cleaning can get your carpets and rugs 1500% cleaner then you can with only vacuuming. Vacuuming does NOT kill germs and bacteria. Contact us now to schedule a professional cleaning.